KibaAlpha What cards do you think I could\should pull to make room for 6-10 more Apostles? 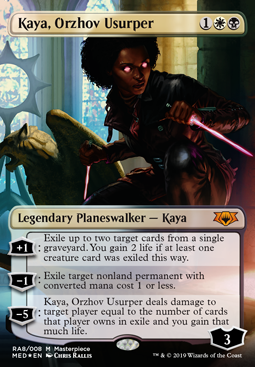 I was think Kaya, Orzhov Usurper and Ob Nixilis of the Black Oath , Trading Post , Whip of Erebos (?) and spot removal( Asphyxiate \ Take Vengeance ? Another way to get some value off of your Zubera idea is to run 3 or 4 Viscera Seer or even Hidden Stockpile for fun. Lets you scry and get some extra value over time. However, in terms of your sideboard there's a few options you can go with... I think the most broad I'll put below with small explanations and then it can be altered as needed? Maybe? 4x Leyline of the Void --> "Best" graveyard hate since it can come down turn zero and help to hose out dredge, all versions of Phoenix decks while also slowing down a few other strategies. 2x Destructive Revelry --> The card is good, however, not needed as a 4 of. Leyline of Sanctity isn't played nearly as much, Leyline of the Void is awkward to bring in against you since you still get Zubera value from the death trigger and Rest in Peace is the same. Other key artifacts or enchantments you can try to go around/under due to smaller creatures being annoying. 3x Path to Exile --> Kill it, kill it dead. This is 15, and it should be broad enough to help in several match ups, but it can also be tuned to be better/stronger for what you need. I feel that the options here are easy enough to understand when you'd bring them in and makes choices easy when playing against opponents, however, I also threw this together real quick before work so I'm sure I missed a few things. Either way, this gives an idea of a few cards to look into. 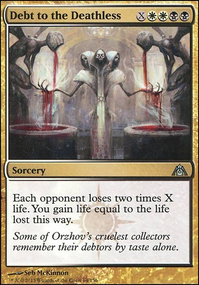 Other options include Surgical Extraction , Crumble to Dust , Fulminator Mage , Thoughtseize , Nihil Spellbomb and it can just keep on going.... Rakdos Charm is a personal favorite of mine for Sideboards in X decks! absolutely needs more win conditions. the win conditions you have (the Snapcaster Mage , Kaya, Orzhov Usurper , and Jace, the Mind Sculptor ) will just take far too long to win. nobody likes going into overtime in their matchups. i would cut a land, and all Esper Charm , Logic Knot , and Spell Snare to make room for Mana Leak , Remand , Thoughtseize , and win conditions. 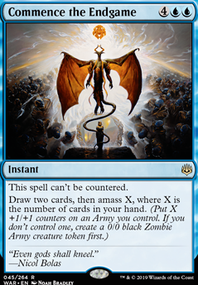 with fetchlands, shocklands, Thoughtseize , and maybe even a couple Anguished Unmaking , Death's Shadow becomes a good way to close out a game. Mission Briefing acts as additional copies of Snapcaster Mage with the added benefits of adding cards to your graveyard (in the event your graveyard doesn't yet have anything worth giving flashback, it offers a glimmer of hope you can find something in your top 2 cards), as well as the benefit of deck manipulation to flip a Delver of Secrets Flip, another good win condition. 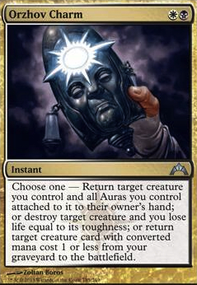 if using delver, Serum Visions is also a must. With 36 planeswalkers in the set there is absolutely no way we don't get more and better planeswalker removal. I also definitely don't expect each planeswalker in War of the Spark to be powerhouses like Teferi, Hero of Dominaria . I think they were likely testing out utility planeswalkers with Dovin, Grand Arbiter , and Kaya, Orzhov Usurper in the last set and many of the new ones will be similar. Of course it's safe to assume some of the planeswalkers will be quite powerful, like Nicy, Ugin, and probably Karn, but tbh I don't think that they will or should cut back on planeswalkers in the future (I'm talking about the usual 2-3 per set). 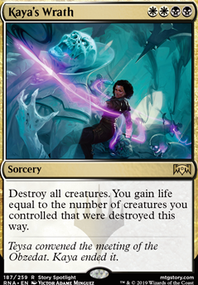 Sure some players don't like them and think they're too powerful, but in general the amount of removal for planeswalkers has increased and they're not as difficult to remove as they were when JTMS was first released. Also it's not like there's really a dominant planeswalker deck in any format, so clearly it's not the card type in itself that is busted, just the design of a few of them. Nice first build on Karlov! He is my main commander and my pet deck wich I keep changing constantly because there is just too much to choose from. I've been playing him for more than a year now and in my opinion there are 2 subthemes you can go for. Of course your main theme is lifegain, wich I'll get to in a bit. The Token build is the other option, trading in much of your removal for the ability to go wide with Karlov. Often triggering cards like Soul Warden . You'll play lots of cards benefitting creatures entering and in an aristocrat style devouring the tokens. Signature Cards: Regna, the Redeemer , Grave Pact , Blood Artist , Ayli, Eternal Pilgrim . This brings us to the first problem with Karlov, he can't really do both. You just don't have the room to do both. The first build really lends itself to dump in an equipment theme to hit for commander damage, all while giving karlov protection of colors or can't be the target of spells of abilities. This is the other main problem of Karlov. As a voltron commander he has no build in protection, wich makes him very easily removed. If you check my build you'll see the category I run my cards in, wich gives my deck a nice balance of lifegain/removal/tutor/draw/recursion/evasion and protection. It's not perfect, but it's really fun to pilot. +1 Exchange control of any two permanents. -3 Discard a card, then draw cards equal to that card's converted mana cost. -5 You gain 2 life, draw 2 cards, and deal 2 damage to any target for each card you own that another player controls.